Every candidate is keeping an eye out for the next big technology that’ll revolutionize campaigning. Is this necessary? No, and here’s why. President Obama has been heralded as our first tech-savvy commander in chief. He’s been lauded for his masterfully run campaign, that rode the grassroots wave on the heels of social media and the digital age. And since then, no pol wants to miss a beat. Facebook and Twitter are now essential tools for communication; speeches and ads are uploaded to YouTube; blogs are commonplace; and it seems every communications director is keeping an eye out for the next big technology that’ll revolutionize campaigns. Is this necessary? No, and here’s why. 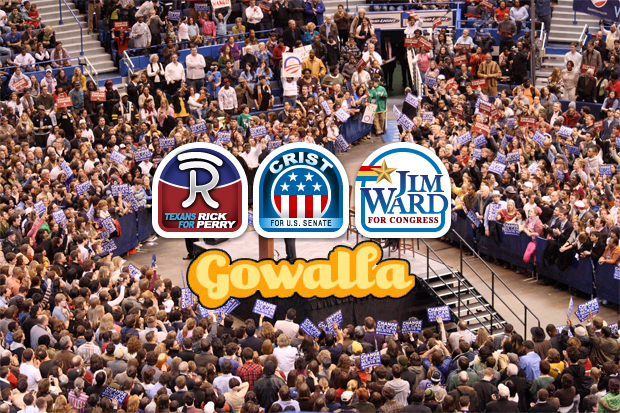 Today, Gowalla launched a new campaign toolkit aimed at helping politicians rally constituents at campaign events. The geo-location service, which allows users to “check in” via smartphones at various locations (restaurants, bars, coffee shops, etc. ), will soon be aiding candidates in drawing in constituents to town halls, campaign fundraisers, and rallies. The new platform enables politicians and campaigns to create events where Gowalla users can “check in” to receive candidate-branded passport stamps for their support. But will keeping on the bleeding edge of technology create an actual edge in the mid-terms? Not likely. Gowalla, for instance, has a fractional number of users than Foursquare–just some 300,000. Spread those users across each state, then divide that number by those who actually care about politics and those who are party-affiliated, and this new campaign tool cannot possibly have a significant impact. Take Rick Perry. How many Gowalla users are there in Texas? Of that number, how many are Republican? And of that number, how many are motivated enough by “check ins” and stamps to actually attend a Perry fundraiser? Certainly, Gowalla has found a new potential revenue stream from politicians who are eager if not desperate to latch onto the next digital tool that’ll save their floundering campaigns. However, Gowalla and other similar startup services are not large enough yet to get the vote out like Facebook, Twitter, and YouTube, especially on state elections. But that doesn’t mean geo-location services won’t play a big role in the coming years. Until then, candidates, don’t expect geo-location to help you find large numbers of voters.